The Satelliters'"Outta Here!!" offer a distinctive and authentic organ-driven garage sound that might just as well have been recorded in the 1960s. Compared to their previous two albums, the record is a little bit more back to the roots and thereby perfect for any lover of '60s garage punk and fuzz guitars. 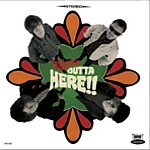 The album starts off with the ingenious and catchy song "Outta Here," which is followed by several wild garage pieces, accompanied by organ that reaches its climax in the masterpiece "Lost in Time," Their cover version of The Modds' "Leave my House" has a bit more beat to it than the original and bears the unmistakable Satelliters vocals. "Waste of Time" is reminiscent of The Music Machine, while "Eyes Cry Tears"could be best compared to The Miracle Workers. This album is a must for garage fans!